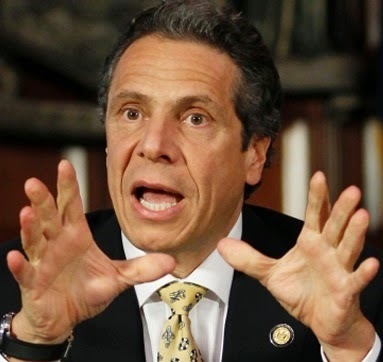 As all Court watchers and political junkies in New York know, Governor Andrew Cuomo deliberately chose not to make his pick for the Court of Appeals by the deadline. Instead, on that day, Friday, October 3--the end of the 30-day period in which he was required to do so under the law--he announced on Susan Arbetter's Capitol Pressroom that he wouldn't. He would wait another 14 days. The Guv said he was doing so to reduce the politics in the appointment process. As he explained, if he had made his nomination by the deadline, the state Senate would be required to conduct confirmation proceedings prior to election day. Soooooo, he assumed that, unlike him, the Senators would abide by their deadline under the law. That they would be holding their hearings within 30 days after he made his nomination. The problem? The Senators would have to return to Albany in the midst of campaign season. That might inject campaign politics into the hearings. Cuomo's decision to bypass the deadline does not make him a criminal. It does not make him a crook. It does not make him corrupt. It does not make him a "law-breaker"--not in the sense of being some kind of an outlaw. In fact, we're talking about the Judiciary Law. Not the New York Penal Code--i.e., the state's criminal law. Beyond that, the specific provisions of the Judiciary Law neither express nor imply any criminal penalties--or any penalties at all--for failure to comply. The law does not mention any enforcement mechanism, either government prosecution or private cause of action. Beyond even that, what the Judiciary Law does explicitly state is that the any failure to meet a deadline has no consequence. Such failure "shall not invalidate any appointment." [JUD. LAW § 68 (5).] So, the 30-day deadline has no teeth--and expressly so. That's a mandate, not a suggestion. And the Governor failed to comply. Now no, this is not the taking of a bribe. Not blackmail. Not extortion. Not the illicit use of a government agency. Not anything equivalent or worse. This is, however, the Chief Executive of the State--whose primary duty is to enforce the law--refusing to obey the law himself. Violating the law, treating a violation as inconsequential, has consequences. It invites disrespect for the law, and invites others to treat the law similarly. It may well be that the Governor's delay beyond the deadline has absolutely no effect on his making a wise nomination choice. It may well be that the Governor's reasons for delay make good sense. Maybe compelling good sense. I, for one, wouldn't go to war over it. But it will henceforth be a little more difficult to insist that all the different players in New York's appointment process must obey the law. The Governor's failure to do so this time can be pointed to by the Nominating Commission, by the Senate, and by future governors as illustration that the law may be treated with indifference and blithely disregarded, without fear of any ramification or repercussion. If this delay makes it politically more likely that Governor Cuomo will reappoint Judge Victoria Graffeo, and less likely that there will be partisan resistance from Senate Democrats, then it will have borne good fruit. (I've made no bones about the fact that I support her as the best choice for the Court.) But, a Governor's deliberate disobedience of the law--like any President's--is cause for considerable concern. At the least, the Judiciary Law should be amended so that it may not so readily be disregarded. Either that, or perhaps there should be some provision for an exemption from deadlines when the Governor and the Senate agree that compelling reasons justify an extension of time. What is not acceptable, however--not if we are serious about the rule of law--is for a governor, or any other public official, to simply declare that the law is inconvenient and that it will therefore not be obeyed.